“WE ARE proud to launch our autumn campaign, it represents who our brand is and shows how fashion is vehicle for self-expression,” says, Shiraz Tayob CEO and Founder of Zui. 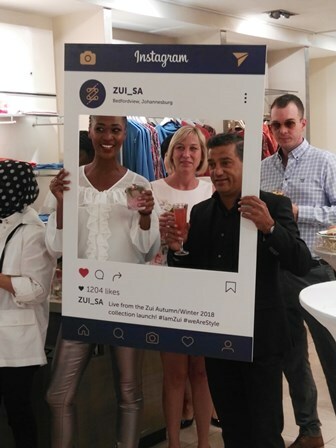 He was speaking at the launch of autumn/winter 2018 collection at their Bedforview branch, were a handful of guests enjoyed the fashion parade by model Mirriam Ngomani- such a sweetheart- flowing Canapés and fashion. Zui is an independent fashion retailer for women with stores in Johannesburg and Tshwane, and the garments are available in store and nationally online. It delivers high-quality fashion and ready-to-wear collections that are premium, yet accessible. The boutique whose target market is for the well-heeled, launched March 2 2018 and online will be available in stores globally from July 27. According to a business partner, the fabric is imported from Italy hence the Italian touch and signature; resplendent in the shop, founded 2009. “We aim to portray a wide array of influences that would appeal to our client base,” says Tayob. One female journo added glamour to her wardrobe after winning a stylish coat worth around R4000 during the competition. Erratum: We mentioned in the story the date July 27 instead of 12 March. We apologise for the error.